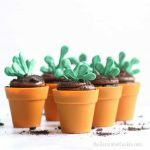 If you’re looking for a quick, easy, colorful, cute (pausing to think of more adjectives), kid-friendly treat to make, look no further. 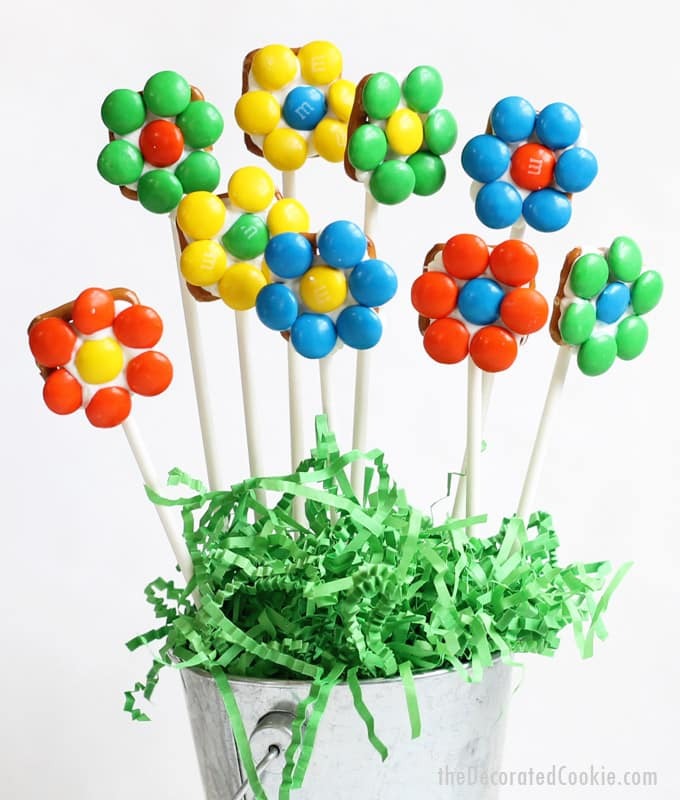 Flower pretzel pops are for you. 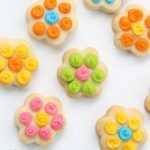 (Flower pretzel bites?) 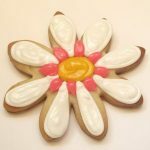 Or for mom, since arranged in a bouquet, these would make a great homemade Mother’s Day gift. 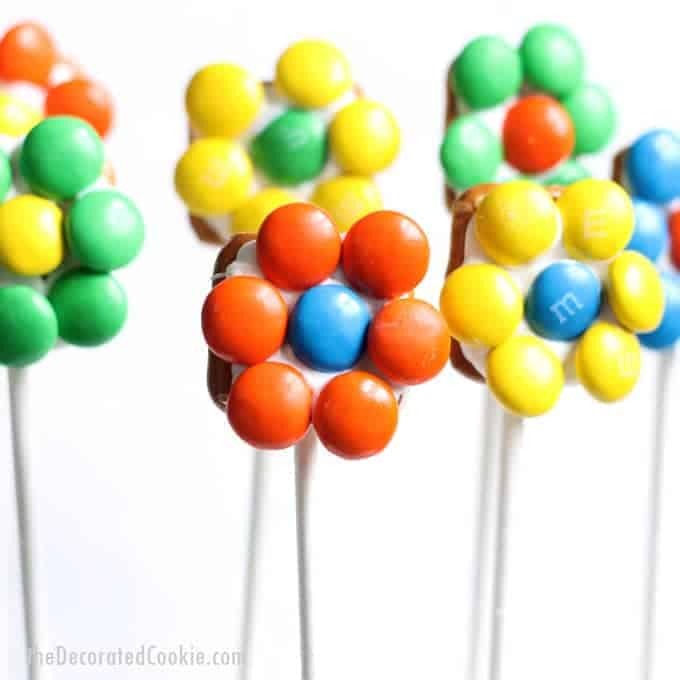 All you need to make them are M and M candies (I used the regular so they would have more of a rainbow vibe, but if you have any pastel ones leftover from Easter, even better), square pretzels, white candy melts, and some lollipop sticks. 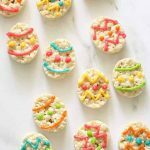 If candy melts aren’t your thing, you may substitute white chocolate. A few notes if you do that: White chocolate takes longer to set, so add that time into your calculations. You may also put the pretzels in the fridge so the chocolate sets more quickly. White chocolate also gets a good bit hotter when melting, so I do NOT advise melting white chocolate directly in the decorating bag. Melt the chocolate in a bowl first and pour into the decorating bag. 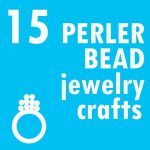 Speaking of decorating bags, you may also substitute a Ziploc bag and use that as you would a decorating bag. I suggest the freezer-grade bags, as they are thicker. 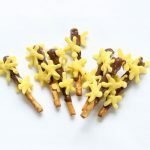 If you like these, make sure to check out these Forsynthia branch chocolate pretzels. 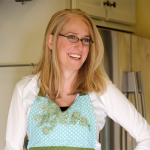 Or, make mom a bouquet of rose chocolate pops. 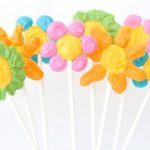 To make a flower pretzel pop bouquet, jam a Styrofoam block (cut to size so it fits nice and tightly) in a container. Insert the pops and arrange tissue paper or shredded, colorful paper on top of the Styrofoam. 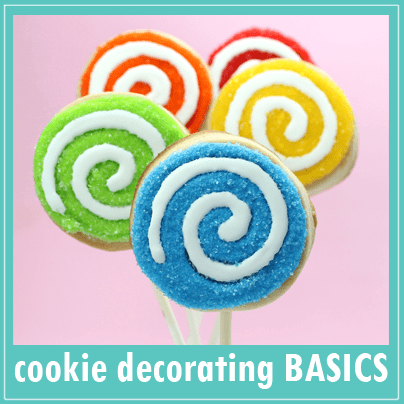 *Find the candy melts, lollipop sticks (size 6-inch or 8-inch recommended), and disposable decorating bags (freezer-grade ziploc may be used as well) at the craft store. 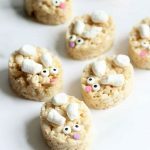 You may substitute white chocolate for the candy melts, but allow extra time for the chocolate to set, or put the pretzels in the refrigerator to set more quickly. Do not melt white chocolate chips directly in the decorating bags, as they will get too hot. Snip the tip of the decorating bag. 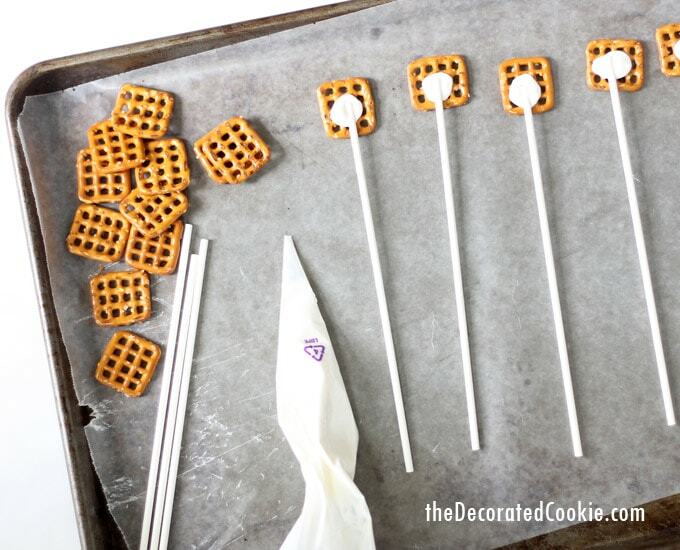 Pipe a dot of candy on a pretzel and place a lollipop stick on top. 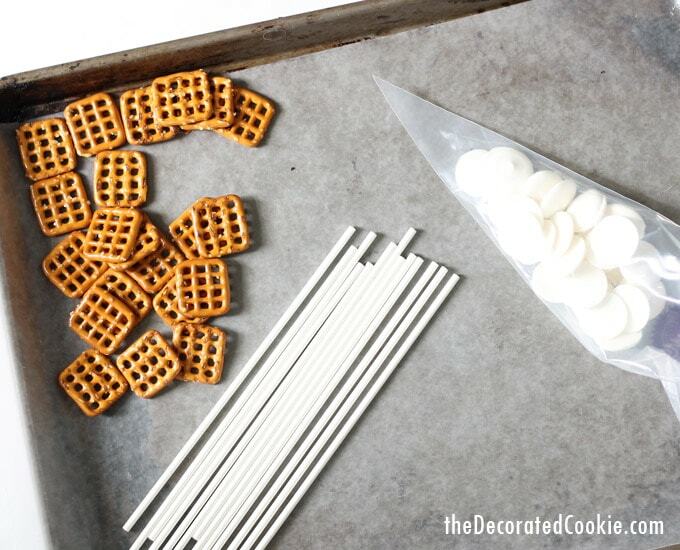 Repeat with the rest of the pretzels and let set well, at least 30 minutes (longer for white chocolate). Flip the pretzels over. Reheat the candy melts to be sure they are fully melted again. Pipe to cover a pretzel with the melted candy. You don’t need a lot of the melted candy, just enough coverage so the M and Ms attach. 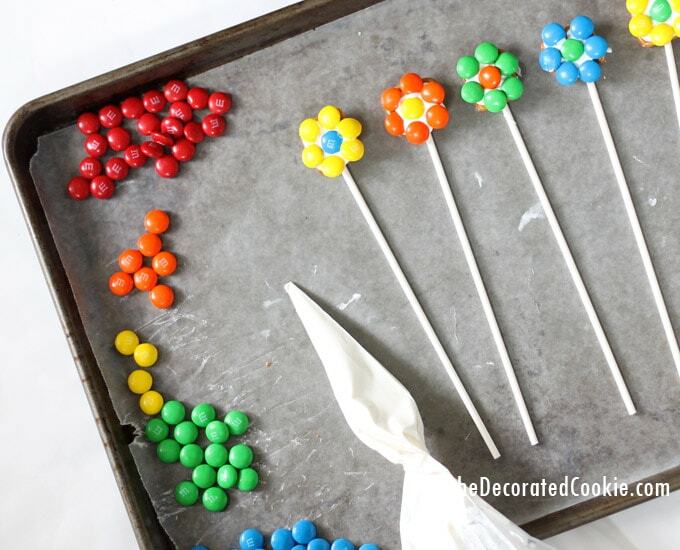 Arrange the M and M candies on top to make a flower. Let set very well. 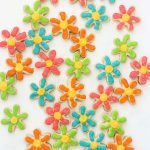 TIP: If the M and Ms start to slide off when you are arranging the flowers, just let the candy melts set a few minutes and try again. Flip the pretzels over. Reheat the candy melts to be sure they are fully melted again. Pipe to cover a pretzel with the melted candy. You don't need a lot of the melted candy, just enough coverage so the M and Ms attach. 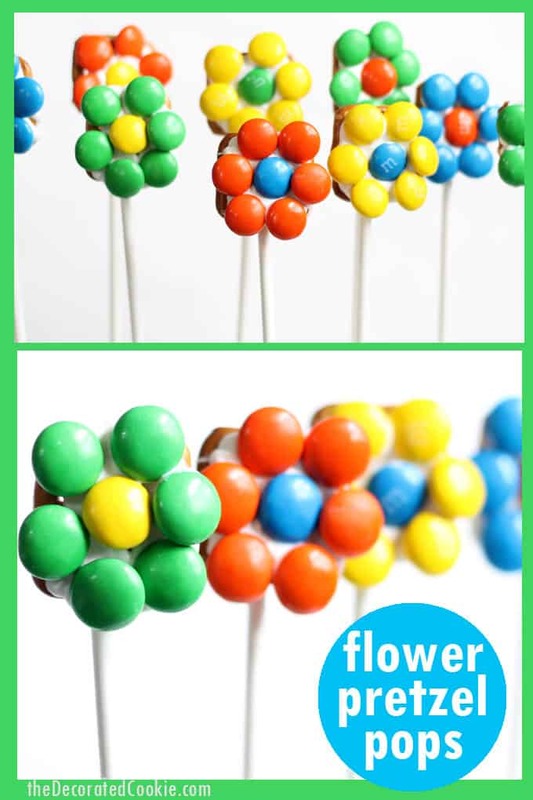 Arrange the M and M candies on top to make a flower. Let set very well.